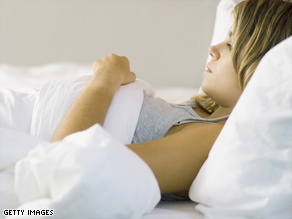 Study: Can more sleep help fight off colds? Are you getting enough sleep? If not, it could be hurting your health. Researchers don't know why less sleep makes people more prone to colds, but believe it affects the immune system. A new study suggests that people who lose just a bit of sleep, or those who have poor quality sleep, are more likely to get sick after being exposed to a cold virus than those who get more shut-eye. "People who slept less than seven hours were about three times more likely to get a cold than people who slept eight hours or more a night," said Sheldon Cohen, psychology professor at Carnegie Mellon University, in a podcast. The study was published Monday in Archives of Internal Medicine. Cohen and his colleagues interviewed 153 men and women ages 21 to 55 every day for two weeks. They asked how long they slept, how much they tossed and turned before dropping off, and whether they felt rested in the morning, in addition to other factors. After that, the study subjects were quarantined for six days and given cold-virus-containing nose drops at a dose about 125 times the amount that it takes to infect cells in a laboratory. They found that 88 percent of people became infected with the virus (as measured by cold virus in their nose or antibodies in their blood), but not all of those people actually got sick. About 43 percent of the volunteers had signs of infection plus cold symptoms, such as a stuffy nose, cough, and sore throat. "People whose sleep was disturbed were much more likely to develop colds than people who went to sleep, slept all night, and got up in the mornings," said Cohen. Study subjects who had less than seven hours of sleep were at greater risk than those who got eight hours of sleep a night. And those with lower sleep efficiency, the amount of time they spent in bed asleep, were at higher risk too. People with a sleep efficiency of less than 92 percent had a 5.5-times greater risk of developing a cold than those with a 98 percent or more sleep efficiency. The researchers don't know why less sleep is associated with a greater susceptibility to colds. They believe that sleep deprivation or sleep disturbances may affect the immune system's ability to function at an optimal level. Dr. David Rapoport, the director of the sleep medicine program at New York University School of Medicine, said the study adds to a large body of research on the interaction between sleep and the immune system. "Many of the molecules and substances that circulate in body and also within cells overlap between immune function and sleep," he said. "There are parallel paths here, so it's not at all surprising that they affect each other." "Everybody knows that when you're sick, you sleep. Likewise, when you don't sleep, that seems to -- according to grandma -- make you more susceptible, and this study is along those lines. So it's not totally out of left field to find these relationships," he said. However, relying on the volunteers to recall how much they slept tends to be a relatively inaccurate way to measure sleep time, so it's hard to say if 10 minutes of lost sleep would really make a difference, he says. "Insomniacs worry a lot and the last thing you want to do is add to their worries," Rapoport said. "You can't quite jump from the conclusion that people who get less sleep who were selected from a relatively healthy population will have exactly the same effects as people who have a chronic condition that limits the amount of sleep they get."